It’s important to keep hips strong and flexible at any age, but especially in the later stages of life. The hips contain more than 20 muscles and these can deteriorate over time due to lack of use or neglect. Fortunately, devoting just a little time and attention to this area of the body can be helpful in avoiding future troubles. Here are some tips for keeping hips in tip top shape. Maintaining strong hip joints, muscles and ligaments can help with stability and mobility, resulting in fewer slips and falls. Regular stretching and strengthening of the hip area can also lessen the pain or discomfort associated with arthritis or osteoarthritis and may significantly reduce the need for a partial or full replacement down the road. There are a number of exercise regimens that can be every beneficial for older adults. 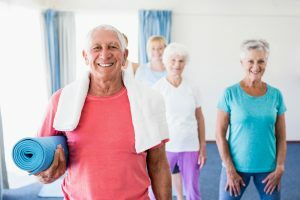 For those who enjoy group exercise programs, activities such as yoga, Tai Chi and water aerobics can be helpful for stretching the muscles and ligaments around the hips while also promoting strength in the bones and muscles. As an added benefit, these activities may improve balance, relieve stress and boost mood. Seated Hip March: While sitting in a chair, lift your bended knee up as high as is comfortable and hold for 3 seconds. Complete 10 repetitions on each side. Side Hip Raises: While standing facing a chair, raise one leg out straight and hold for 3 seconds. Repeat 10 times on each side. Sit To Stand: Slowly lower yourself to a seated position keeping your back straight. Then, stand back up. Repeat 10 times. Reclining Butterfly Stretch: Lay on the floor with your back flat on a mat. Slowly bring your feet together with the soles of your feet facing each other. Let your knees fall naturally open as far as is comfortable. Hold for 10 seconds. Repeat three times. Happy Baby Pose: Lay on the floor with your back flat against the mat. Slowly bring your knees into your chest. Let your knees fall apart slowly while holding the back of your thighs. Hold the stretch for 10 seconds. Repeat three times. In addition to the exercise suggestions outlined above, consuming a diet rich in vitamin D, calcium and omega-3 fatty acids can be beneficial in keeping muscles and bones healthy and strong. As always, it’s important to consult with your doctor before beginning a new exercise or dietary program. Many people find it easier to start and maintain healthy habits in a group setting. At Lighthouse Senior Living, both of our communities offer a wide spectrum of wellness programs and serve delicious meals that may be customized to meet specific dietary requirements or requests. To learn more about our supportive communities, contact us to schedule a tour today.